I've wanted to do a post about my tattoos for a while, but just haven't got around to it, but finally... here it is! It's funny really because, all throughout my life I can honestly say that I'd never had the urge to get a tattoo; that isn't to say that I haven't admired them on others, but I've just never even thought of getting one. It was only mid-way through 2016 that I started to consider one and I wish I could come up with a really noteworthy reason for my decision but I'm afraid the reason is all kinds of cliche! I was going through the early stages of 'finding my feet' spiritually speaking, allowing the way I truly was inside come out and not continue to hide the kind of person I was from people; I wanted to mark the occasion in a way that I would always remember, so I chose to get three 'glyphs' on my left ribs (where they wouldn't be visible to anyone but me really). The meaning of the glyphs are 'Challenge', 'Transform' and 'Transcend', which was perfect for what I felt like at the time and, to be quite honest, still feel like now (aren't we always evolving?). For me, this tattoo, as simple as it is, represents me finding my alignment mentally, physically and spiritually and it is a constant reminder of growth. As this was my very first tattoo experience, I had no idea of what to expect and felt so nervous (even though what I was getting wasn't going to take very long at all!). The tattoo artist was so lovely and put me right at ease and, even though she mentioned that the ribs are a sensitive place, especially for a first timer like me, it was actually fine! I felt as high as a kite that I had actually got this done but honestly thought that would be the end of my tattoo experiences. It is also worth mentioning that my mum basically had a heart attack when I told her about having it done (I told her afterward, not before!) but, to be fair, I did tease her a little by telling her I had a huge dragon on my entire side-body, just to ease the blow when she actually saw it! (*insert huge grinning emoji here*!!). Fast forward to this year, around February time, when I all I could think about was getting something new. I'd been planning some ideas and searching for an artist who worked in super-fine detail/lines for a while, eventually finding the perfect girl for the job, Remy, at a studio called Atlier Four, in Truro. 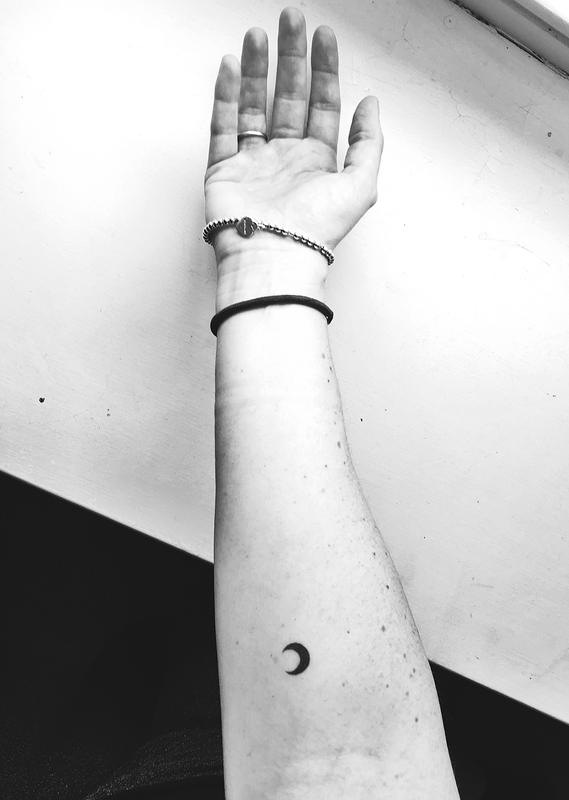 This time I had not one, but two ideas; I'd always wanted a little crescent moon on my forearm, just something super simple (and the only visible one I had planned). The moon is a representation of feminism, spirituality, creativity, growth and dreaming big, so I was planning on getting this as an add-on to the larger piece I wanted (more on my moon later!). 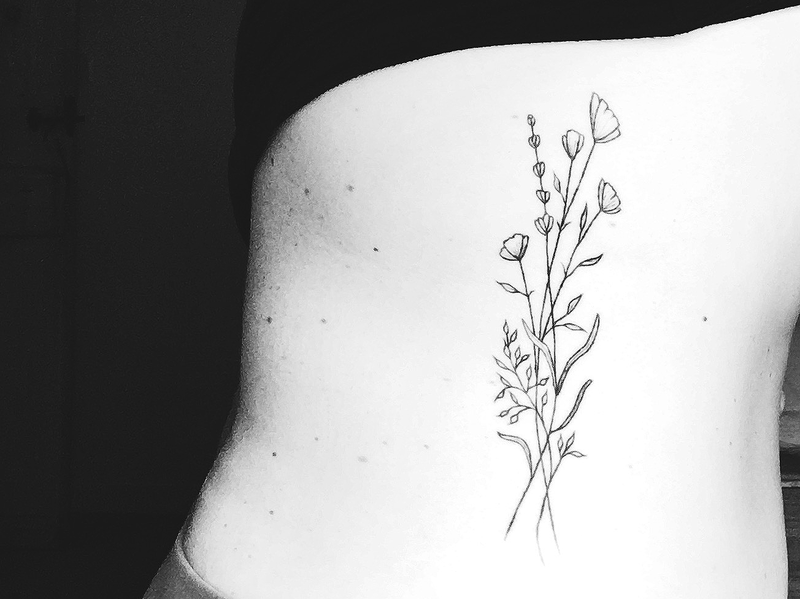 The main piece I wanted was wildflowers, this time on my other ribs and much bigger than my first little gesture! Remy designed such a beautiful piece, and I couldn't be happier with it; the details are so intricate and fine, which is exactly what I had in mind. Pain wise: there were certain areas that were much more sensitive, but overall it was good! It took about two hours (including the moon tattoo, which didn't hurt one single bit!). The reason for the wild flowers, for me, were to represent my on-going struggle with mental health. Wild flowers are strong, even when they look weak, and they continue to survive even in the wildest of environments; they cling to life when the weather tries to knock them down and they always bloom anyway. I think they are the perfect metaphor for the cyclical nature of my mental health battle and I love this so much. Moving on to the present day and I have in mind to have one little thing added to my moon tattoo, which is something botanical (but small) just underneath it. I want it to represent being grounded but looking to the sky, and I am currently pinning and sketching lots of ideas out so that, someday, I can get that added. 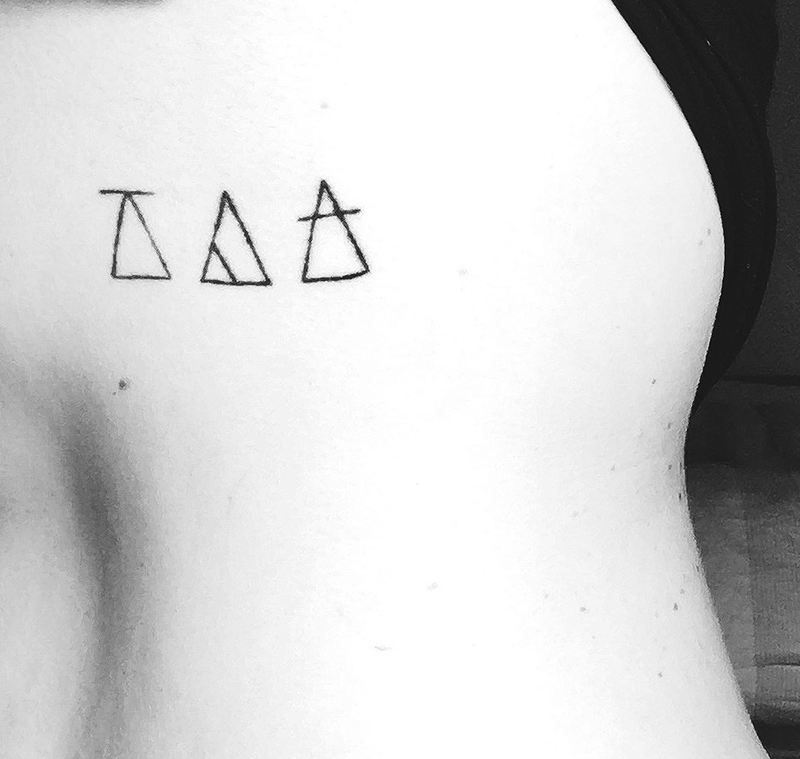 I also fancy something below my glyphs too, but I'm not sure what yet. As someone who wasn't a fan of getting tattoos I can say that I am converted! Either that or I am having a mid-life crisis... oh well! Do you have any body art? Let me know in the comments! I adore your tattoos Lucy, especially the wild flowers, ever so beautiful :) I've never wanted a tattoo before, but then again, never say never! !